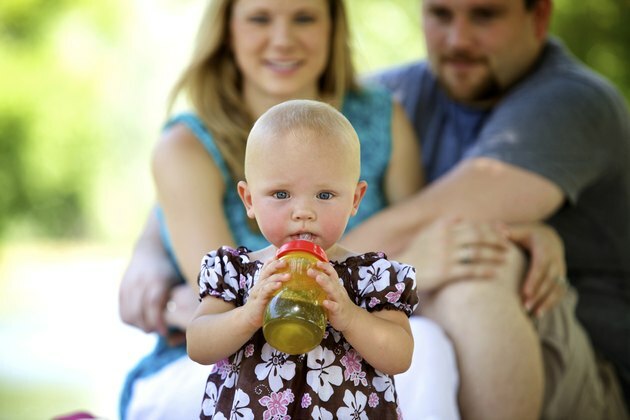 By the time your child is 14 months old, he'll be able to eat most of the foods that the rest of the family eats. Until your child's first birthday, all his nutritional needs are met by breast milk or formula, but once he enters toddlerhood, a balanced diet becomes extremely important since he'll be getting most of his nutrients and calories from table food. Don't expect him to eat large portions -- young toddlers only need about 1,000 calories a day, according to HealthyChildren.org, the website of the American Academy of Pediatrics. Plan for three meals each day, as well as two snacks -- one in the mid-morning and one in the afternoon. 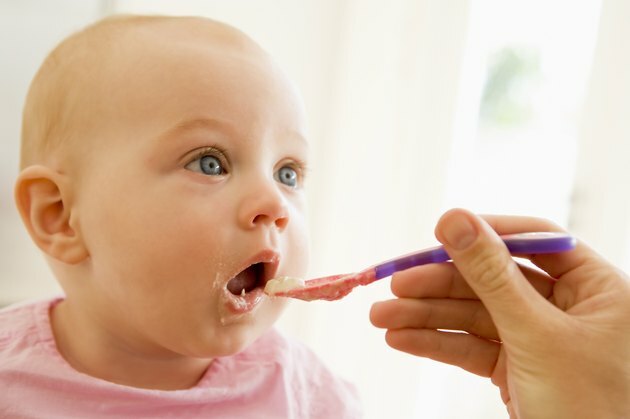 Grains make up a significant portion of a healthy diet for a 14-month-old child. 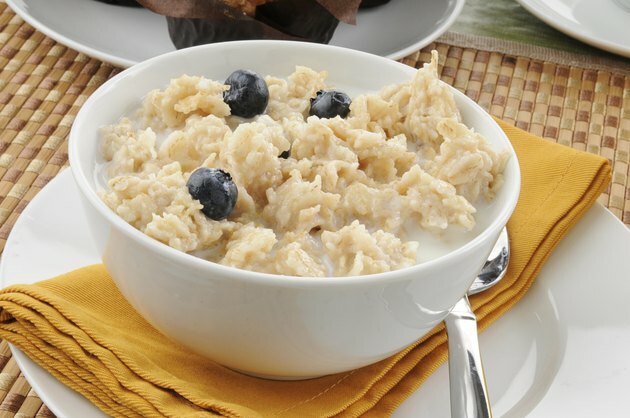 Choose whole grains, such as brown rice, oatmeal and whole-wheat bread, over white grains as much as possible. Try to incorporate at least one serving of grains into every meal and snack your child has throughout the day. Toddlers should have six servings of grains per day, but a serving is quite small. For example, one-fourth of a slice of bread, 4 tablespoons of cooked rice, cereal or pasta, or 1/4 cup of dry cereal make up a serving. Fruits and vegetables are important sources of many different nutrients and vitamins young toddlers need. Vary the fruit and vegetable choices and try to include one serving of each at most meals. A serving of vegetables for a 14-month-old is about 1 tablespoon, and a serving of fruit is equal to one-fourth cup of canned fruit, one-half piece of fresh fruit or 2 to 4 ounces of juice. Choose 100-percent juice to avoid added sugar, and limit your child to no more than 4 to 6 ounces of juice per day, recommends the Lucile Packard Children's Hospital at Stanford. Dairy products are rich in calcium, which is vital for building strong bones. Milk makes up most of a 14-month-old's daily dairy requirement of two to three servings. One-half cup of milk equals one serving. Choose full fat milk with vitamin D, and limit your child's intake to no more than 16 to 24 ounces per day to avoid iron deficiency, cautions the KidsHealth website. Other healthy sources of dairy include cheese and yogurt. Protein sources should make up the smallest portion of your child's daily diet, according to the USDA Food Guide Pyramid for Young Children, but it's still important for your child to get two to four servings of protein each day. Choose lean sources of protein, such as lean meats, poultry or fish. Beans and peas are also an excellent protein source to add variety to your child's diet. A serving of meat for a 14-month-old consists of 1 ounce, and a serving of cooked beans or peas is equal to 2 tablespoons. What Should an 11 Month Old's Diet Be?